The Aerial Construction Company of Hartford, Connecticut, was established in September of 1911 for the purpose of building a commercial airship of German design that could carry passengers. The business office was located at 212 Asylum Street, Room 10, in Hartford. The company started with $50,000 in capital. The officers of the company were listed as: President, F. W. Dart; Vice-President, F. W. Stickle; Treasurer, F. C. Billings; Secretary, H. Franklin Wells; managing Director, Joseph K. Kopacka, all of Hartford. The company’s Chief Engineer was listed as John Twardus of Germany, who was known for his work in aeronautics. The company announced plans to begin construction of its first airship, to be named “The Hartford Flyer”, as soon as possible. The Hartford Flyer would have a 135 foot long cigar-shaped gas-bag with a car situated underneath capable of carrying seven passengers and a pilot. The ship would be powered by a 75 h.p. motor capable of driving it through the air at forty to fifty miles per hour. It is unknown if this airship was completed. Artist rendering of the first dirigible produced for the U.S. Navy. On January 22, 1916, The Manufacturers Exhibition opened in New Haven, Connecticut. One display that drew great interest was a model of a dirigible airship that had been constructed by the Connecticut Aircraft Company of New Haven; the first dirigible ever built for the United States Navy. At the time of the exhibit, the airship was in a hangar at the Portsmouth Navy Yard in New Hampshire, undergoing some final preparations before it would sail to Pensacola, Florida, to under go trials and testing. The initial order for the dirigible was placed May 14, 1915. It was reported at that time that the ship would be constructed in New York, assembled in New Haven, Connecticut, and shipped for trials to the Pensacola, Florida, Naval Aeronautic Station, all under the supervision and guidance of the Connecticut Aircraft Company. The model displayed at the exhibition was designed to be towed by a battleship traveling 25 miles per hour against a 15 mph wind to be utilized by lookouts, and spotters for directing ship’s fire during battle conditions. Traditional balloons had proved to be problematic in this roll due to their lack of stability under these conditions which often resulted in seasickness for the observers. The completed dirigible was described as being be 175 feet long, 50 feet tall, and 35 feet in diameter. It would carry a crew of eight, and cost $45,636. 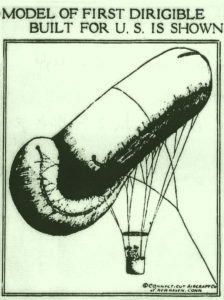 The balloon was built with inner compartments that divided the front from the back, either of which could be pumped full with regular air to displace the hydrogen gas so as to make one end of the ship heavier or lighter to aid in ascending or descending. Government specifications required that the dirigible be capable of rising at the rate of 8 feet per second. Fabric for the balloon was manufactured at the United States Rubber Company. On March 13, 1917, with the United States now involved in World War I, contracts totaling $649,250 were awarded to four manufacturers to produce 16 additional dirigibles for the U.S. Navy. Three dirigibles to be built by the Curtis Aeroplane Company in Buffalo, N.Y., for $122,250. Two dirigibles to be built by the Connecticut Aircraft Company of New Haven, CT., for $84,000. Nine dirigibles to be built by the Goodyear Tire & Rubber Company of Akron, Ohio, for $360,000. Two dirigibles to be built by the B. F. Goodrich company in Akron, Ohio, for $88,000. During its tenure in business, the Connecticut Aircraft Company build 177 airships and balloons of various kinds. In 1921 the company was acquired by a Delaware corporation known as the Aircraft-Construction Corporation, and continued to produce dirigible airships under that name.